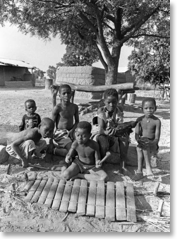 The gyil is a 14-key frame xylophone played during funerals by the Lobi people from Ghana’s northwestern region. Gyil music combines overlapping melodies and bass patterns enveloped by a dense layer of buzzing. The keys are cut from the liga, a red hardwood tree, and strung above gourds that are modified with thin paper or spider silk to create a sympathetic drone. Playing the instrument with the two heavy mallets takes great endurance, and a musician may be expected to play for several hours before another takes over. Mourning and celebrating reafﬁrm to the participants that their lives will be honored in the same way. Photographing this topic led me to appreciate the difficulty of describing something as complex as music in the service of social celebrations. The photos show how the gyil is a means to socialize the young into eventual roles as respected musicians as well as a means to create social space. Most importantly, we see the power of musical performance to articulate collective mourning and the celebration of life. In addition to photographs, Colter Harper made audio recordings of the funeral music in Ghana. Colter agreed to give us a quick audio tour to accompany his photo essay in the print magazine. To listen, just click the “+” icon for each clip. These clips were all recorded near the village of Kalba in the Upper West Region of Ghana. The funeral took place in the courtyard and the adjacent fields. Colter Harper is a Ph.D. candidate in ethnomusicology at the University of Pittsburgh. His research focuses on African-American and West African music. The music clips are a great supplement to the photo article. However I wished the wailing could be heard better. As a child growing up in Ethiopia, many, many times I heard (mostly women) wailing of the dead and it was much more of a painful sound. It would have been helpful to have a comparative comment on music in funerals. I would suggest that the author or others be invited to add that on the web or in future issues. How unique are the Ghana instrumentations and rituals? To the webmaster: the MP3s worked really well! It would be helpful to have the length of the sound clip in the descriptions.